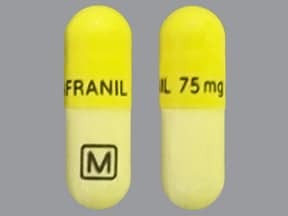 Who should not take Anafranil? Clomipramine is used to treat obsessive compulsive disorder (OCD). It helps decrease persistent/unwanted thoughts (obsessions), and it helps reduce the urge to perform repeated tasks (compulsions such as hand-washing, counting, checking) that interfere with daily living. This medication belongs to a class of medications called tricyclic antidepressants. It works by restoring the balance of certain natural substances (serotonin, among others) in the brain. Read the Medication Guide provided by your pharmacist before you start taking clomipramine and each time you get a refill. If you have any questions, ask your doctor or pharmacist. Take this medication by mouth with or without food as directed by your doctor. To lessen side effects such as stomach upset, clomipramine may be started at a low dose, given in several doses during the day with meals, and slowly increased as your body gets used to it. After you have reached the best dose for you, the total dose can be taken once daily, usually at bedtime to prevent daytime drowsiness or as directed by your doctor. Usually, the daily dose will not be more than 250 milligrams for adults and 200 milligrams for children and teenagers. Follow your doctor's instructions carefully. Do not take more or less medication or take it more frequently than prescribed. Your condition will not improve any faster and your risk of side effects such as seizures may be increased. Dosage is based on your medical condition and response to therapy. Use this medication regularly in order to get the most benefit from it. Continue to take it even if you feel well. To help you remember, use it at the same time(s) each day. Do not suddenly stop taking this medication without consulting your doctor. Some conditions may become worse when the drug is abruptly stopped. You may experience sweating, dizziness, nausea, vomiting, headache, or irritability if you suddenly stop taking this drug. Your dose may need to be gradually decreased. It may take 2 to 3 weeks or longer before the full effects of this medication are noticed. Inform your doctor if your condition persists or if it worsens. What conditions does Anafranil treat? Dizziness, drowsiness, dry mouth, constipation, stomach upset, nausea, vomiting, changes in appetite/weight, flushing, sweating, tiredness and blurred vision may occur. Anxiety symptoms may temporarily worsen when you first start taking clomipramine. If any of these effects persist or worsen, notify your doctor or pharmacist promptly. Tell your doctor right away if you have any serious side effects, including: mental/mood changes (e.g., confusion, depression, memory problems), enlarged/painful breasts, unwanted breast milk production, irregular/painful menstrual periods, muscle stiffness, ringing in the ears, sexual problems (e.g., decreased sexual ability, changes in desire), shakiness (tremors), numbness/tingling of the hands/feet, trouble urinating, easy bruising/bleeding, unusual/uncontrolled movements (especially of the tongue/face/lips), severe stomach/abdominal pain, dark urine, yellowing of eyes/skin. This medication may increase serotonin and rarely cause a very serious condition called serotonin syndrome/toxicity. The risk increases if you are also taking other drugs that increase serotonin, so tell your doctor or pharmacist of all the drugs you take. Get medical help right away if you develop some of the following symptoms: fast heartbeat, hallucinations, loss of coordination, severe dizziness, severe nausea/vomiting/diarrhea, twitching muscles, unexplained fever, unusual agitation/restlessness. Get medical help right away if you have any very serious side effects, including: black stools, chest pain, fainting, slow/fast/irregular heartbeat, seizures, vomit that looks like coffee grounds, eye pain/swelling/redness, widened pupils, vision changes (such as seeing rainbows around lights at night). 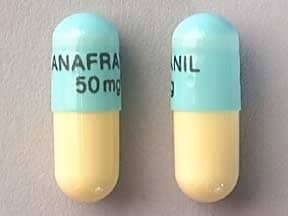 List Anafranil side effects by likelihood and severity. Before taking clomipramine, tell your doctor or pharmacist if you are allergic to it; or to other tricyclic antidepressants (e.g., imipramine, nortriptyline); or if you have any other allergies. This product may contain inactive ingredients, which can cause allergic reactions or other problems. Talk to your pharmacist for more details. Before using this medication, tell your doctor or pharmacist your medical history, especially of: blood problems (e.g., purpura, thrombocytopenia), breathing problems (e.g., asthma, chronic bronchitis), personal or family history of glaucoma (angle-closure type), eating disorders (e.g., bulimia), heart problems (e.g., arrhythmias, coronary artery disease, recent heart attack), intestinal problems (e.g., chronic constipation, ileus), liver problems, kidney problems, personal or family history of other mental/mood conditions (e.g., bipolar disorder, schizophrenia), history of hospitalization for a very serious reaction to certain medications (neuroleptic malignant syndrome), heartburn/stomach acid in the esophagus (e.g., due to hiatal hernia), seizures, overactive thyroid (hyperthyroidism), trouble urinating (urinary retention, enlarged prostate), any condition that may increase your risk of seizures (e.g., alcohol/sedative dependency, use of electroconvulsive therapy, brain injury/disease), certain types of tumors (e.g., pheochromocytoma, neuroblastoma). Clomipramine may cause a condition that affects the heart rhythm (QT prolongation). QT prolongation can rarely cause serious (rarely fatal) fast/irregular heartbeat and other symptoms (such as severe dizziness, fainting) that need medical attention right away. The risk of QT prolongation may be increased if you have certain medical conditions or are taking other drugs that may cause QT prolongation. Before using clomipramine, tell your doctor or pharmacist of all the drugs you take and if you have any of the following conditions: certain heart problems (heart failure, slow heartbeat, QT prolongation in the EKG), family history of certain heart problems (QT prolongation in the EKG, sudden cardiac death). Low levels of potassium or magnesium in the blood may also increase your risk of QT prolongation. This risk may increase if you use certain drugs (such as diuretics/"water pills") or if you have conditions such as severe sweating, diarrhea, or vomiting. Talk to your doctor about using clomipramine safely. This drug may make you dizzy or drowsy or temporarily blur your vision. Alcohol or marijuana can make you more dizzy or drowsy. Do not drive, use machinery, or do anything that needs alertness or clear vision until you can do it safely. Limit alcoholic beverages. Talk to your doctor if you are using marijuana. Older adults may be more sensitive to the side effects of this drug, especially bleeding, confusion, dizziness, and QT prolongation (see above). This medication should be used only when clearly needed during pregnancy. Newborns exposed to clomipramine during pregnancy may experience withdrawal symptoms or side effects. Tell your doctor right away if you notice jitteriness, shaking, feeding problems, fast breathing, or seizures in your newborn. Since untreated mental/mood problems (such as obsessive compulsive disorder, depression, panic attack) can be a serious condition, do not stop taking this medication unless directed by your doctor. If you are planning pregnancy, become pregnant, or think you may be pregnant, immediately discuss with your doctor the benefits and risks of using this medication during pregnancy. Some products that may interact with this drug include: anticholinergics (e.g., atropine, belladonna alkaloids, scopolamine), certain drugs for high blood pressure (e.g., clonidine, guanethidine, reserpine), cisapride, digoxin, thyroid supplements, valproic acid, drugs that can cause bleeding/bruising (e.g., "blood thinners" such as warfarin/heparin, anti-platelet drugs including aspirin or NSAIDs such as ibuprofen). Many drugs besides clomipramine may affect the heart rhythm (QT prolongation), including amiodarone, dofetilide, quinidine, sotalol, pimozide, procainamide, macrolide antibiotics (such as erythromycin), among others. Therefore, before using clomipramine, report all medications you are currently using to your doctor or pharmacist. Other medications can affect the removal of clomipramine from your body, which may affect how clomipramine works. Examples include barbiturates (such as phenobarbital), cimetidine, haloperidol, certain drugs for heart rhythm (such as flecainide/propafenone), certain HIV protease inhibitors (such as fosamprenavir), phenothiazines (such as thioridazine), certain anti-seizure drugs (such as phenytoin), terbinafine. Check all prescription and nonprescription medicine labels carefully since many medications contain pain relievers/fever reducers (NSAIDs such as aspirin, ibuprofen, naproxen) that, if taken together with this drug, may increase your risk for bleeding. Low-dose aspirin, as prescribed by your doctor for specific medical reasons such as heart attack or stroke prevention (usually at dosages of 81-325 milligrams per day), should be continued. Consult your doctor or pharmacist for more details. Does Anafranil interact with other medications? If someone has overdosed and has serious symptoms such as passing out or trouble breathing, call 911. Otherwise, call a poison control center right away. US residents can call their local poison control center at 1-800-222-1222. Canada residents can call a provincial poison control center. Symptoms of overdose may include: fast/irregular heartbeat, severe dizziness, fainting, delirium, seizures, loss of consciousness. Laboratory and/or medical tests (e.g., EKG, liver function tests, blood counts) may be performed regularly to monitor your progress or check for side effects. Consult your doctor for more details. 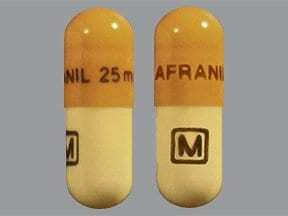 This medicine is a ivory melon yellow, oblong, capsule imprinted with "ANAFRANIL 25 mg" and "M". This medicine is a aqua blue ivory, oblong, capsule imprinted with "ANAFRANIL 50 mg". This medicine is a ivory yellow, oblong, capsule imprinted with "ANAFRANIL 75 mg" and "M". Are you considering switching to Anafranil? How long have you been taking Anafranil?